Over my several decades as a celebrity fitness expert, I’ve discovered some harsh truths about client compliance. If you hate burpees – I mean, root-canal-equivalent hate them; not just dislike incorporating them into your routine – you won’t do them on your off days. Clients who complain about $5-a-dozen pasteurized eggs yet fit a daily $5 Frappuccino into their daily budget will never forego that sugary coffee milkshake, even if they eventually also buy eggs. No amount of reasoning can persuade them otherwise. bananas. I learned that the hard way many years ago when I told a 30-something client to pull them from her morning smoothie and all hell nearly broke loose. For the record, I’m not anti-banana. I’m not anti-fruit at all. But I also don’t think fruit should become a free-for-all food, and some choices are better than others. Well, except maybe Juicy Fruit gum or Starburst chews. Ok, ok… I know these aren’t really fruit. Joking aside, all fruits provide vitamins, minerals, fiber, phytonutrients, and other good stuff nature loaded into one pretty, colorful, uniquely shaped package. But just as in life, some are better than others. I had a friend in high school who graduated valedictorian. I hardly got to see her because she stayed involved in so many clubs. For a self-proclaimed nerd, guys really dug her. She seemed to have it all: Style, intelligence, humor, and kindness. She was my senior class’s rock star yet she carried nary a hint of arrogance. Another friend did pretty well grade-wise. He pulled mostly B’s with an occasional C. Because he never got involved in extracurricular activities, I saw a lot of him, and we became best friends. He was smart but not Harvard-bound, if you catch my drift. What does this have to do with fruit? Well, berries are my valedictorian sometimes-friend. They’ve got it all. Nutrients galore, fiber, and lots of health-promoting compounds scientists haven’t even discovered. Plus they’re low in sugar. If blueberries were a band, they would get main stage at Lollapalooza right next to Outkast. Bananas would get a side stage. They lack berries’ A-list nutrient profile, and they’re higher in sugar. They’re simply passable, though hardly A-list rock stars. That doesn’t make bananas bad, just not among your optimal fruit choices. More berries, less bananas. For some reason, bananas have a reputation as a high-potassium fruit. Yet a medium banana packs a mere 12% of your potassium daily value. Avocado (one of a few high-fat fruits; yes, you read that right) actually packs more potassium without banana’s sugar. What’s Up with Fructose in Fruit? Whereas some folks see it as an unlimited healthy food, fruit has lately received a bad rep in some circles. “Vegetables provide all the nutrients fruit does – more so, in fact – for fewer calories and sugar,” someone recently told me at a recent conference. He proceeded to explain how modern-day fruit has become modified to taste sweeter than what our Paleolithic ancestors ate. Critics have rightly attacked fructose, a particularly nasty sugar. While it doesn’t elicit the insulin response glucose does, fructose goes straight to your liver, since liver cells are the only cells that can process fructose. I’ve seen fructose as a “healthy natural sweetener” in ice cream, cookies, and other junk foods. (Don’t even get me started about agave, which is up to 90% fructose.) Using fructose sounds healthy (since it comes from fruit, right? ), and manufacturers can claim a food is “low glycemic” since fructose doesn’t raise blood sugar. What it can do in excessive amounts, however, is create liver inflammation, hormonal imbalances, caloric dysregulation (leading you to overeat), and all sorts of other problems. Oh, and guess what your liver converts fructose to? Triglycerides, or fat, which store conveniently around your midsection. But fructose in fruit and fructose in ubiquitous high-fructose corn syrup (HFCS) are two very different things. An apple contains about 15 grams of fructose, but it comes wrapped with fiber, antioxidants, and nutrients. There’s a world of difference between getting those 15 grams of fructose in an apple or a soda. Especially as an athlete, I don’t foresee any problems even if you load your smoothie with several pieces of fruit. Just keep in mind that because fruit contains fructose, you won’t get that desired post-workout insulin response you’d get with another higher-carb food like brown rice. Listen, I understand fruit provides sweetness and flavor to your smoothie. It can also provide vitamins, minerals, antioxidants, and other recovery-promoting nutrients. Just opt for the right kinds. I see gyms selling fruit smoothies loaded with added sugars. One container I found in my gym smoothie fridge contained strawberries soaking in sugar and that nasty syrupy liquid that I remember using during my bartending days. Can I Eat Fruit for Fat Loss? Yes. Most fruits are mostly water. Even something like watermelon, a fruit slightly higher in sugar, contains about 92% water. Great for summer months to prevent dehydration. Fruit also contains fiber to buffer out sugar and improve satiety. But two caveats for fruit and fat loss. You want to choose berries, avocado, and other lower-sugar fruits. And despite what Weight Watchers claims, fruit is not an unlimited food for fat loss. I recommend no more than three servings of low-sugar fruits per day when you want to lose fat. Sorry. I know they’re convenient and taste good, and Jamba Juice as well as some other brands have done a hell of a job marketing those drinks as healthy, but take a look at sugar content on some of these suckers. Seriously: a large Jamba Juice Aloha Pineapple® Smoothie contains a whopping 24 teaspoons of sugar. That’s like drinking a milkshake. Pass on these health-food impostors and stick with whole fruit. Weekend brunch with my girlfriends sometimes entails a mimosa. I request a little bit of fresh-squeezed OJ and champagne. But ordering a gargantuan glass of OJ or whatever favorite juice is basically drinking sugar water. Like I mentioned above, fruit is the “whole package.” But juice that fruit and you strip away its fiber, leaving nutrients (good) but also quickly absorbable sugar (not good). Same thing goes for juice cleanses, “100% real fruit juices,” and those exorbitantly priced juices lining your local health food stores. When in doubt, read those labels and odds are, you’ll reshelf them. 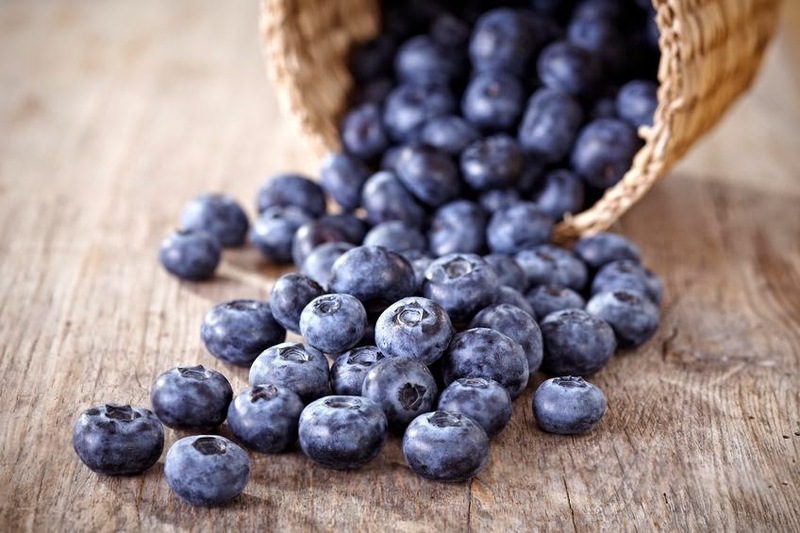 · Blueberries – the Kayne West of the fruit world. Highest in antioxidants, low in sugar, with impressive amounts of fiber and nutrients. · Raspberries – nutrients, antioxidants, and one cup of these guys pack a super-impressive eight grams of fiber. · Strawberries – an all-around nutrient-powerhouse favorite. · Avocado – the king of all fruits, even if most folks don’t think of it as a fruit. Super low in sugar, high in heart-healthy monounsaturated fat, with more potassium than a banana. One cup packs a whopping 10 grams of fiber. · Apples – while a little higher in fructose, I can’t leave this favorite fruit off my list. Smeared with a little almond butter, it makes the perfect snack. Almond butter doesn’t just make apples taste better. The healthy fat and protein in nut butter helps you better absorb the fat-soluble nutrients in apples and buffers some of the fruit’s sugar. You can do this with any fruit. Frozen blueberries taste almost like ice cream stirred in unsweetened Greek yogurt. Freshly sliced strawberries can top the perfect summer salad. How prevalent a role does fruit play in your diet? Are there any fruits you try to minimize or avoid? Share your thoughts below or on my Facebook fan page.